Flat Lettering Brushes "Jet Stroke" series 1962 by Andrew Mack Brushes, is an excellent overall Flat lettering brush. The "Jet Stroke" is normally used for larger lettering and production lettering. It can also be used as a fill-in brush and an outliner for large letters. The long hair length allows the brush to carry a lot of paint. This brush is suitable for most surfaces. It is a mixture of pure squirrel and black ox. It has a flat ferrule and the hair comes in graduated lengths. 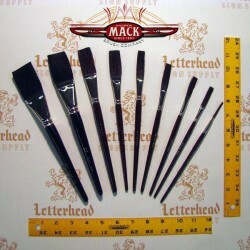 Available in 1/8", 1/4", 3/8", 1/2", 5/8, 3/4", 1", 1-1/4" and 1-1/2" Individual Flat Lettering Brushes "Jet Stroke" series 1962 by Andrew Mack Brushes listed below!